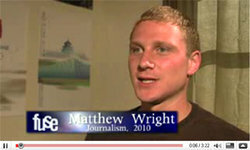 Journalism major Matthew Wright '10 admits to eating Michael Phelps's fries at the Olympics while working for NBC. 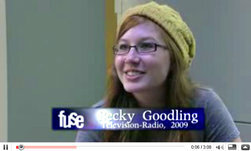 Television-radio major Becky Goodling '09 describes her experience in China -- and what it was like to sing for NBC anchor Lester Holt. For more details and reflections on Beijing check out our Olympics website. Want to Be a Sports Reporter? 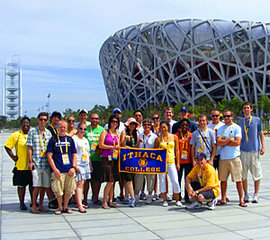 Ithaca was one of only seven American colleges and universities from which students were recruited to intern for these two programs. When the students weren’t hard at work covering water polo, handball, fencing, and other key events, they shared an insider’s view of the event by blogging. Here are a few edited excerpts from their posts. 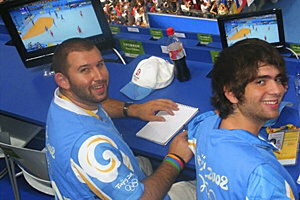 Cory Francer '10, and Stephen Keller '09 take notes at the Olympic handball gold medal match. After three days in China I am experiencing mind-blowing culture shock. I have such new respect for people who pack up and move to a different country without speaking the language. China is interesting. I will definitely say that. And dining hall food is dining hall food no matter where you go. I cannot believe, however, how different our American idea of Chinese food is from the actual food people eat over here. And eating with chopsticks? Forget it! I am about ready to give up and buy silverware. But I will persevere, as long as my hands stop cramping up halfway through a meal. We found the Super WalMart near us today. There are actually three of them in Beijing. Talk about cross-cultural influence.I couldn’t believe how weird it was to be in an Americanized store that was so different from what I was used to. We almost cried when we were finally able to buy (and eat) peanut butter. The first real protein I have eaten in three days! The weirdest thing I have experienced thus far is the public bathroom situation. They don’t have real toilets, just a “fancy” hole in the ground and no toilet paper! It is without a doubt the weirdest thing ever! The feeling is in the air. 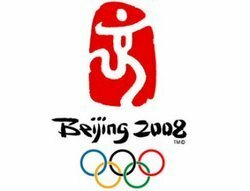 Excitement, anxiety, and uncertainty as a city, nation, and world prepares for the 2008 Beijing Olympics. It seems that everyone in the city cannot wait for the show to start. Around the Olympic Green, I’ve been stopped by local Beijing residents asking to pose for pictures with them. On the subway, I’ve been interrogated by other riders about what exactly I’m doing for the games, where I am from, and how long I am staying. It’s an exciting time to be here, as China is looking to fully break out as a major world power and make a big splash on the world’s stage. Hopefully a smooth Olympics will give them the boost they need. This Olympics is really one of the most important games in recent times, and it’s unbelievably surreal to actually be a part of it. But for now, life goes on as usual in Olympic Land. Two days into the fencing competition and I am hooked! I have learned so much about fencing in the last six months it is astounding. I have actually been able to help several American journalists in both the press tribunes and mixed zones. It doesn’t seem like many of the American journalists are fencing experts. I got a chance to interview Team USA women’s foil coach Mike Pederson yesterday, and it has been the highlight of the fencing hall as of yet. Not only was he more than willing to talk with me, but he was also extremely excited to share his knowledge and expectations for the sport. I have been able to speak with so many world-class athletes it makes my head spin. I honestly cannot believe I am here at the Olympic Games. What an opportunity! All the hard work, training, flying, and jet lag has paid off. Watching the opening ceremonies the other night we all just kept repeating how shocked we were that we were there. I am looking forward to more fencing and more fun. Since starting as a flash quote reporter, I developed an immense amount of respect for the sport of fencing. These fencers are not only outstanding athletes, but their personalities range from down to earth and polite to overconfident. As a flash quote reporter I had to remain impartial to any one country’s fencers so my questions would be fair and unbiased. This standard of professionalism had me resisting the urge to chant “U-S-A” with the U.S. fans in each bout, even though I would have loved to support my country’s fencers, who impressively won six medals and were tied with the Italians on the fencing medal count. Being a flash quoter has also given me an understanding of journalism even though weweren’t the ones writing articles. After talking to many of the journalists in the mixed zone and seeing how my quotes were used in articles and daily event reviews, I now better understand the process. After all, getting the quotes to use in your article is half the battle. After years of planning, hard work, and dedication, the Olympic Games are over. It has been such a journey and adventure for me. I’ve learned so much about my own strengths and weaknesses. I came here one person, and I am leaving another. Knowing that I am only 21 years old and have already worked at one of the most influential and important events in the world is astonishing. This trip is only the jumping-off point for me and everyone else here. I know that no matter what I do with my life, careerwise and personally, I will use lessons I learned while here in Beijing. I am so thankful to have had the opportunity to come and experience the Olympic Games and I can only thank those who helped me get here. I heard that sentence countless times during my time working as a flash quote reporter for handball, and no matter how many times I heard it, it never got old. The first time an athlete said that to me was when Jung Suyoung of team Korea scored a tying goal with seconds ticking off the clock to end the game. When I spoke to him after the game, he could not stop smiling, and the joy on his face was enough to make me smile as well. For a journalist, capturing the emotion of a moment is one of the most important things. Being able to share the greatest moment of someone’s life with others is an amazing feeling. Seeing the joy on these athletes’ faces as they achieved their own form of glory has proved to me that the Olympic dream is still alive. These athletes will never forget these moments, and having the honor of sharing them is a memory that will stay with me forever. 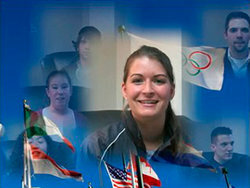 I had a blast working for NBC’s Olympic Highlight Factory. That’s as obvious as Misty May-Treanor and Kerri Walsh winning gold in beach volleyball—you knew it would happen. What I didn’t expect was the responsibility I was given. I worked on the set of Saturday Night Live as a shot selector. I edited footage from the Beijing games into highlight reels and encore footage for www.nbcolympics.com. One of my videos received 2.2 million hits in less than 24 hours! The interns here were certainly given their fair share of responsibility. Our videos were seen by millions of people. What interns at other places can say that?